It’s been nearly 30 years since Gary Vaillancourt gave his young artist wife Judi three antique chocolate molds for Christmas. She quickly saw their potential as art forms. After experimenting with chocolate and beeswax, Judi visited the Museum of Fine Arts in Boston, where she saw similar chalkware pieces painted in watercolors. She liked chalkware, “because it would last for years and could be heirloom quality.” The forms became blank canvases for her oil painted folk art. In 1984 she launched Vaillancourt Folk Art, a business that would transform her family’s life. Becoming an obsessive collector of antique molds (with the world’s largest collection of more than 2,500 metal molds, plus polycarbonate styles), Judi developed a reputation for creating one of America’s best-known high-end Christmas collectibles. Gary runs the retail and wholesale operations while son Luke now handles the digital marketing and e-commerce division. The family produces pieces in its Sutton, Mass., facility (a historic stone textile mill), focusing on handcrafted chalkware, glass ornaments, paintings and prints, creamware, and a variety of items in the Et Cetera collection such as pop-up cards and serving trays. The 12,000-square-foot building includes a Christmas Museum that traces the evolution of Judi’s art since 1984, a retail Gallery, offices, Blaxton Hall for performances and events, and Artists’ Studios that can be seen on guided tours throughout the year. Judi’s love of folk art goes back to her first trip to Colonial Williamsburg with her aunt when she was 12. “It was love at first sight,” she says. She returned to the living history museum years later on her honeymoon. Now she collaborates with Colonial Williamsburg, offering three cus- tom pieces for the historic site each year. She devotes considerable time to custom designs for catalogs and museums such as Winterthur in Delaware, along with high-end department stores — including Neiman Marcus, Lord & Taylor, Saks, Nordstrom, and Bergdorf Goodman. to Massachusetts after being gone for a month. “I have 35 custom pieces to design when I get back home,” she explained. They left home January 2 bound for Atlanta, where they set up a showroom at the major Atlanta Gift Show, creating a replica of an early ice cream parlor to show the type of setting the molds would have been in originally. “We try to give a lot of history and background of the molds so that people can envision the traditions people used them for, rather than just as decorations,” said Judi. After 14 days in Atlanta, the couple made an unexpected trip to Florida to handle her aunt’s estate, selling her house and moving the contents. One highlight of the Vaillancourt year will be Collector’s Weekend, held the last weekend in April at their Sutton facility and in nearby Worcester. 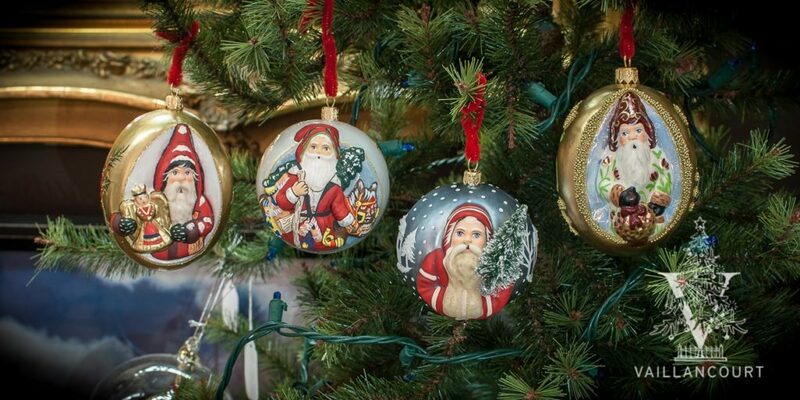 The first event in 1995 drew a dozen dealers who came to enjoy the hands-on experience of painting their own Vaillancourt chalkware Santa and attending seminars. “The weekend is educational and fun, and helps people understand how much work goes into a piece,” says Judi. Now as many as 60 people can paint pieces over the weekend, with many returning year after year to enjoy learning and spending time with other fans of the line. Always open to new ideas, Judi sometimes creates products suggested by collectors at events or via the internet. “What’s wrong with doing an Easter Santa?” someone asked. “With lambs, sheep, rabbits, and pastel colors, it could almost be a baby feel. The web is good,” says Judi. “In July, we do a show on Nantucket Island introducing a custom piece. That show has grown for us every year. Now, so many people from around the country are there. People look forward to that release. “Then we’re into autumn, which really kicks into the Christmas season,” says Judi. in children’s hospitals. The Christmas Opening at their facility in November kicks off the season with the first glimpse of their holiday decorations and a chance to purchase premier numbers of the annual Starlight Santa. Her studio is nestled in the back of the Retail Gallery, next to Gary’s and near Luke’s offices. In addition to designing each chalkware Santa, Judi oversees various aspects of the business, including decorating the retail gallery, managing her art staff, and coordinating all events that Vaillancourt Folk Art holds during the year — including an annual performance in their theatre with the great-great grandson of Charles Dickens. Gerald Dickens puts on five performances in a weekend in the same room used for Collector’s Weekend (which is 160 feet long), bringing to life up to 30 different characters from a Christmas Carol. “It was a natural to have him, since I’m a Christmas fanatic,” says Judi. There is also a local historical tie since Charles Dickens spoke on stage in Worcester in 1868 during one of his two visits to the United States, performing readings from a Christmas Carol. Judi’s creativity inspires those around her. Luke says, “As her son, I am always amazed at what she is able to create — year after year, her products are constantly evolving to the times while maintaining the look and feel that her chalkware is known for. Above all, the level of detail and quality is always the highest. She works long hours — well into the night — seven days a week, but because she loves Christmas, loves art, loves research, and is constantly inspired, she makes pieces that are cherished by thousands of families around the world. “To know that every Christmas morning, someone, somewhere, is opening a Vaillancourt Santa as their main gift is truly inspiring and incredible,” says Luke. His mother adds, “I wish people could all feel the wonderful feeling we have at Christmas, but we get to do it year-round. [Vaillancourt Folk Art] has made such a family. I know we’ve lost several family members this year and we’ll miss them. One was a minister who would do lectures and use his pieces. “It’s just really special, all the relationships we’ve made with people through the collections,” says Judi. Reprinted with permission from Treasures magazine, April 2013, Volume 2, Number 10; 877.899.9977. This is a copyrighted article; copies are prohibited.